388-390 Greenwich Street is home to Citigroup’s New York headquarters and is a standout in NYC’s Tribeca neighborhood. The 388 Tower completed in 1988 was originally home to Shearson Lehman and more recently Travelers Insurance. The 39 story tower’s facade incorporated precast concrete, windows and curtainwall elements into its post modern design. 390 Greenwich is a 9 story structure of precast spandrels and horizontal ribbon windows that sits north of the tower on the same plaza. 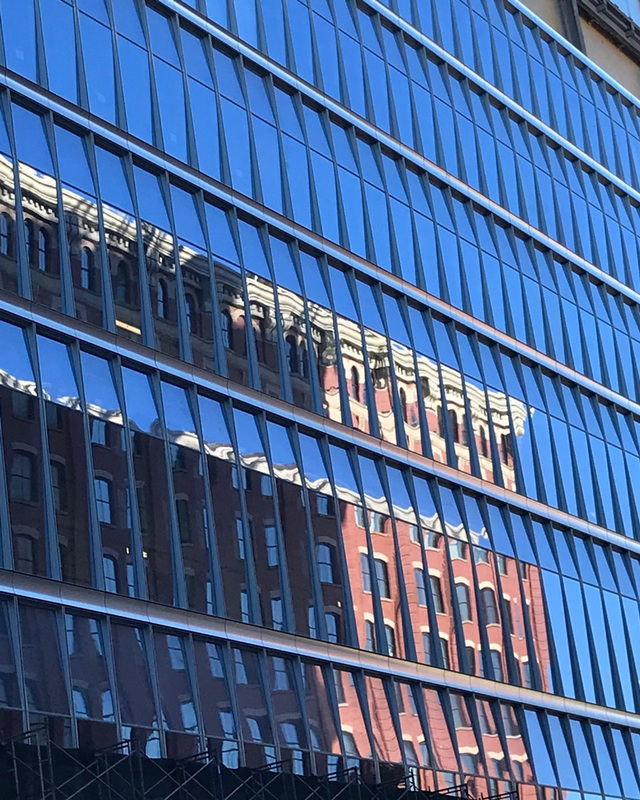 In 2016, Citigroup committed to staying in Lower Manhattan and an ambitious plan was conceived to transform the two-block site into a 21st century workspace. The project, led by Skidmore, Owings & Merrill, had as a goal to create a “town square” space for the plaza with a complete lobby renovation that created transparency and improved circulation. Completing the transformation, the lower 14 stories of 388 and the entire 390 building was reclad into a graceful unified podium. The 388 Greenwich façade features tapering vertical fins at each curtainwall module. 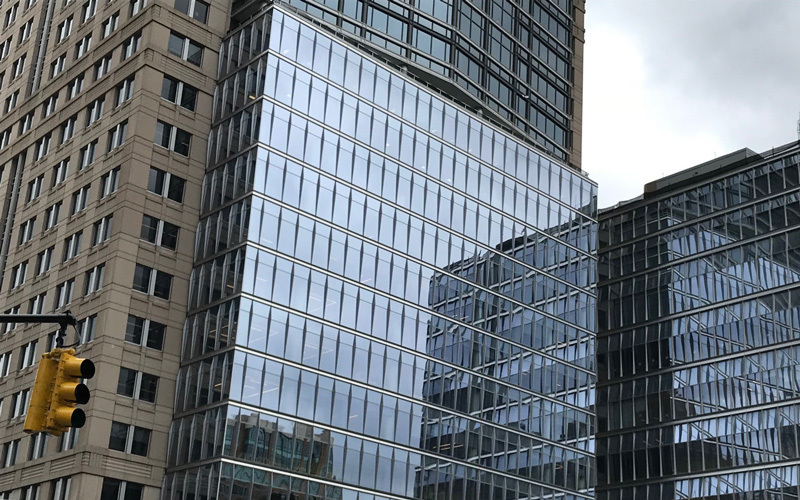 At the 390 building, the glass is sloped outward, and then inward, in juxtaposition to the 388 Greenwich curtainwall with a stainless steel horizontal panel element. 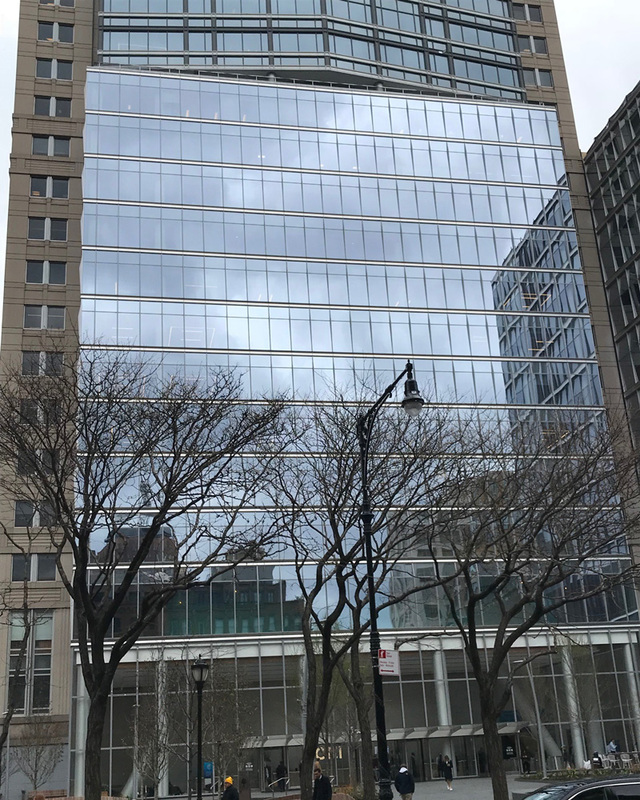 AECOM/Tishman was tasked with the complex construction plan of balancing the two building’s plaza and lobby renovation while they remained occupied during the work. Tishman erected a complete weather wall on the 390 building, 10’ in from the building perimeter during the work. Benson welded new anchors to existing steel spandrel beams and then installed the new curtainwall systems via mobile crane. Benson recently installed the final (2,359th) panel. For more information read this New York YIMBY article.